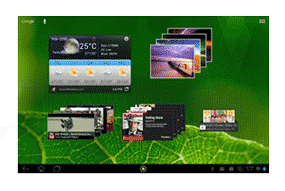 Acer DA220HQL 21.5" Touchscreen All in One Full HD Android PC 1GB RAM 8 GB Flash. The DA220HQL is smarter than a display, on top of its monitor capability. The DA220HQL offers 100% tablet enjoyment by giving you the freedom to explore more than 600,000 Android apps, and to navigate content through touch user interface. Gaming, movie, news, reading, finance, education, health and more -- you name it, you have it with just one click. The enjoyment is further enhanced by the Full HD screen which provides crisp image, sharp details and rich colours. This is the ideal monitor for the house. It can be used as a tablet when you don't want to switch on the PC, a monitor when there is need of more power and even has desktop functionality. Gaming, education, business, health, finance and more -- you have access to thousands of apps with the DA220HQL and Android Play Store. Simply click and download the apps you want from Android Play Store. The DA220HQL also comes pre-loaded with Google Currents, which let you enjoy free online magazines from hundreds of publishers and top websites in one place. It delivers beautiful magazine-like editions for high speed and offline reading. Navigate your content with your fingertips. Click to launch apps, swipe to turn pages, slide to browse contents and pinch to zoom images. Everything is within control under your fingertips. The DA220HQL also features widgets for quick access to the contents of your apps. 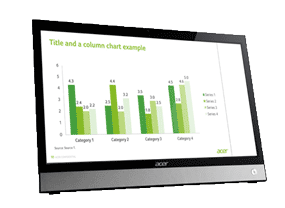 Acer Ring enhances multi-tasking by allowing easy and quick access to any app from any screen. Screenshot, which quickly captures web images, articles, Google Maps, and even smiling faces from video calls. 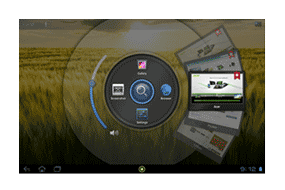 You can access your entertainment quickly with the instant-on capability. The monitor resumes from sleep mode in 1.5 seconds -- meaning no more waiting and complicated processes. Keep up to date with friends and family -- face-to-face -- using the included, front-facing HD webcam. The 1.2 MP camera lets you see expressions clearly, adding more emotion to your conversations. The DA220HQL comes with multiple connection options, including high speed USB 2.0 for easy connection and expansion. You can transfer and view contents from USB-connected peripherals: Keyboard, mouse and gamepad. By connecting to your PC via micro HDMI, the tablet immediately transfers to a monitor, allowing you to work in a normal PC mode. The DA220HQL also features a micro USB audio jack and a port for MicroSD card. With a 178° viewing angle, it is possible to share digital media, play games and watch videos with friends: it does not matter where the person is, the images are clear and bright. The Full HD screen offers crispy image, sharp details and rich colours. The 1,920 x 1,080 resolution display provides ultimate 1080p video, gaming and browsing experience. Text mode--Suited for onscreen viewing and editing of documents, spreadsheets, etc. Enabling a contrast ratio of 100,000,000:1, Adaptive Contrast Management technology enables a dramatic improvement of gradation and detail, especially in very dim or very bright scenes, for stunning picture quality. 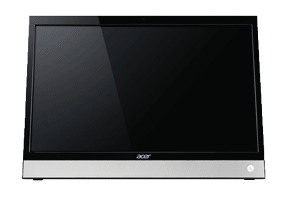 Acer Smart Display DA220HQLAsmiacg - OMAP4428 1 GHz - 1 GB - 0 GB - LED 21.5"